Are Trump's Tariffs on Steel and Aluminum Good or Bad? Home News & Events Blog Are Trump's Tariffs on Steel and Aluminum Good or Bad? By Kaylee Swearingen, Marketing Specialist, Mazak Optonics Corp. Since his campaign began, President Trump has been pro-manufacturing and anti-foreign steel and aluminum. President Trump said the dumping of foreign metals puts America at a national-security risk. 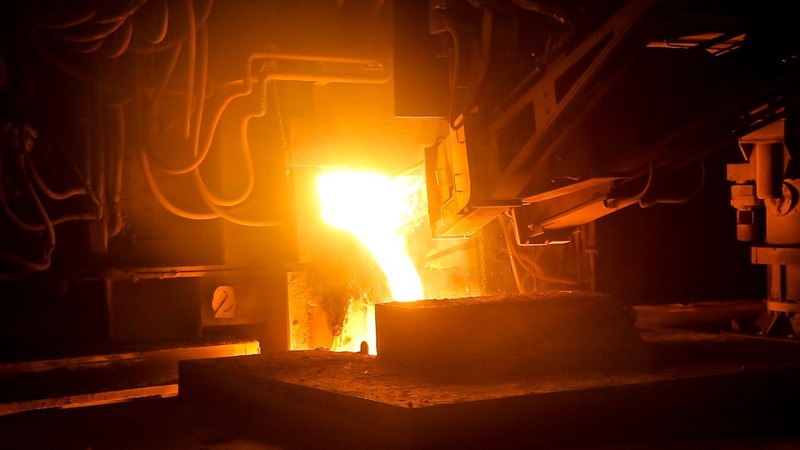 President Trump on March 5th, tweeted, “To protect our country we must protect American Steel!” On March 8th, President Donald Trump has signed an order for 25 percent tariff on imported steel and a 10 percent tariff on imported aluminum. But what does this mean for fabricators and manufacturers? The potential effects are still in question on whether this is a good or bad deal. AK Steel, Century Aluminum and Alcoa all have had their stock prices raised due to this announcement. Many steel manufacturers praised Trump for fighting against foreign competitors who have been unfairly dumping cheap metal into the US market. This is especially important since American steel has yet to fully recover from The Great Recession in 2008. If these tariffs go into effect, these companies will be able to charge higher prices and increase their profits. Currently, the Commerce Department said 90 percent of the aluminum used in America annually is coming from overseas. While domestic steel is not in for such a boost, they are also expected to win from the tariffs. The Commerce Department said about 30 percent of the annual steel used in the US is coming from overseas. The tariffs are a win for steel producers, while making American steel users needing to buy more steal and at an increased price, meaning more profits for producers. Everything that is made from steel and aluminum gets more expensive now. “Since steel and aluminum are used in auto, appliances, airlines, pipes, building infrastructure, beer canes, and soup cans, there could be price increases across the economy,” stated Dan Ikenson, Director of Trade Policy Studies at Cato Institute. Instead of these companies having their bottom line and revenues decrease, it is likely to see the price increases passed onto consumers. Inflation and economic growth are both a major topic involving these tariffs. Many economists think that inflation will increase significantly making everything made of metal more expensive. But General Motors isn’t worried according to their company’s recent statement, “We purchase over 90 percent of our steel for US production from US suppliers. We need to better understand the details around the statement today, but the bottom line is we support trade policies that enable US manufacturers to win and grow jobs in the US, and at the same time succeed in global markets”. But Jim Trainor, Hyundai spokesman stated in an email, “Imposing tariffs on steel could increase production costs, which could lead to higher prices for U.S. consumers, and, potentially, decreased demand”. There has been a flood of comments from organizations on how these tariffs will affect American manufacturing and fabrication. Most of these comments have been against imposing these tariffs. The Aluminum Association doesn’t think this solves the problem. According to Heidi Brock, the Aluminum Association President and CEO, she said, “Unfortunately, tariffs proposed will do little to address the fundamental problem of massive aluminum overcapacity in China, while impacting the supply chain with vital trading partners who play by the rules. 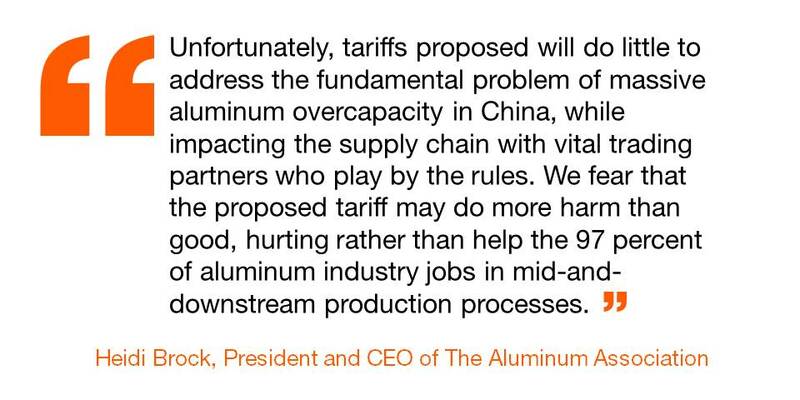 We fear that the proposed tariff may do more harm than good, hurting rather than help the 97 percent of aluminum industry jobs in mid-and-downstream production processes”. HVACR industry is also against it, saying, “As major users of steel and aluminum, we have been proactive in explaining to the administration that the HVACR and water heating industry would be negatively impacted by an increase in tariffs, as would the consumers that rely on the products we manufacture. While we have been pleased with the Trump Administration’s enthusiastic support for manufacturing, we believe this step to be injurious, rather than helpful, to our efforts to increase American manufacturing and create jobs”. Ed Youdell, CEO and President of the Fabricators & Manufacturers Association, International (FMA) said, “One likely result of this action is to add headwinds to the market for American-made fabricated metal product producers. Just when this market had some sustained momentum, the specter of retaliatory duties and tariffs now hangs over this important manufacturing sector. The association is concerned that jobs and job creation are at risk; those countries affected by this announcement will likely choose to circumvent the tariffs by producing and exporting low-cost fabricated metal parts rather than exporting steel and aluminum." But there are some organizations that find these tariffs as a success by standing up for America. 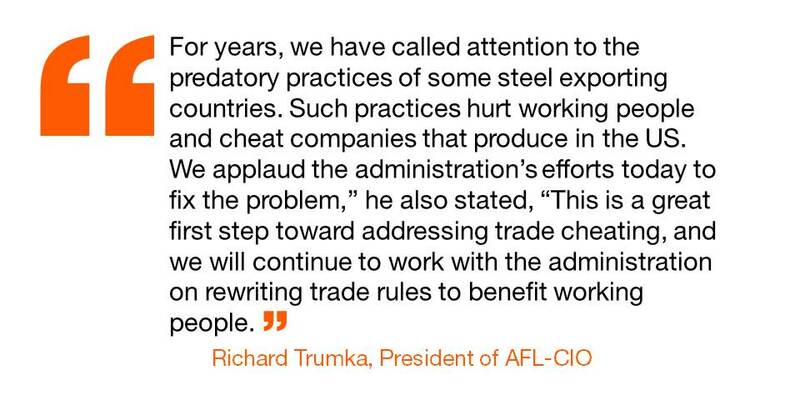 AFL-CIO who’s President, Richard Trumka issued a statement explaining, “For years, we have called attention to the predatory practices of some steel exporting countries. Such practices hurt working people and cheat companies that produce in the US. We applaud the administration’s efforts today to fix the problem,” he also stated, “This is a great first step toward addressing trade cheating, and we will continue to work with the administration on rewriting trade rules to benefit working people”. These effects are still in question. Economist and industry executives are still figuring out the details of these tariffs along with the possible outcomes if they signed and implemented. With these tariffs pinning the US against the world, many countries could retaliate and apply tariffs on American products. The European Union is threatening to apply tariffs to Harley-Davidsons, Kentucky bourbon, blue jeans any many other products if these tariffs go into full effect. Paul Ryan, Republican Speaker of the House of Representatives said he was, “extremely worried about the consequences of a trade war”. Canada is the America’s largest source of foreign steel and aluminum accounting for 40 percent of US aluminum imports and 16 percent of US steel imports. Is this President Trump’s way of playing hardball with Canada over discussions of NAFTA? President Trump did tweet on March 5th, saying, “We have large trade deficits with Mexico and Canada. NAFTA, which is under renegotiation right now, has been a bad deal for U.S.A. Massive relocation of companies and jobs. 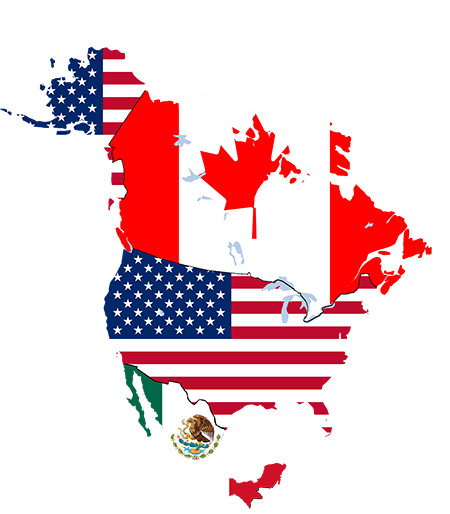 Tariffs on Steel and Aluminum will only come off if [a] new and fair NAFTA agreement is signed”. Overall, these tariffs have not gone into effect but the order was signed. Views from many sides are on display saying both "yay" and "nay" to these tariffs. During the coming weeks, we will know more about what will happen with these steel and aluminum tariffs and the potential impact for the fabrication industry.